A representation of you, women who fight to be part of the norm. You are courageous women dealing with many of society’s impressions, physical losses, life threatening illnesses, and negativity; women who have overcome and became "strong women". 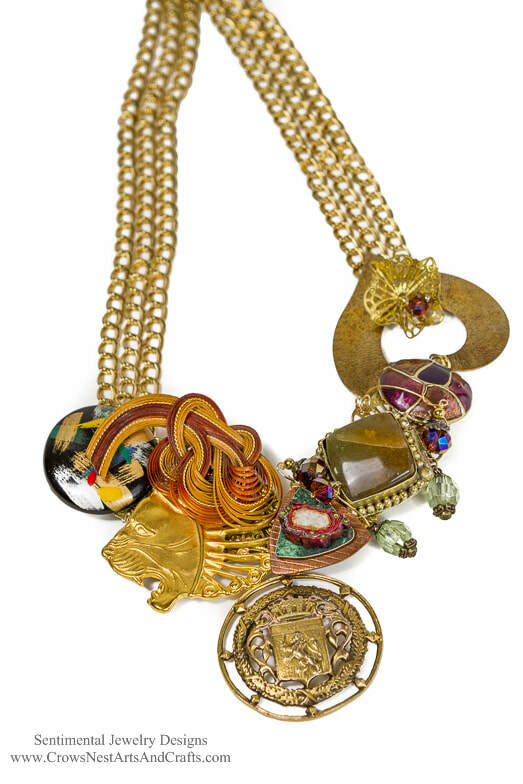 Every element and color of this necklace design has been carefully selected with you in mind. You have the courage of a lion, at times you have abstract emotions, swirls of inspirations, and you don a crest that connects you to family, friends, the world around you and even God all of which bring balance. You are solid as a rock, yet you have an open heart, a large heart ready to give and waiting to be filled. You find joy, embrace the old and welcome the new. Colors of green, brown, gold, purple, white and maroon symbolize your many attributes; nurturing, grounded, rich in spirit, royal, pure, passionate, and growing. the open heart clasp is made from up-cycled jewelry, a hand-made flower using a vintage filigree stamping and purple crystal center. a theme based statement assemblage style. 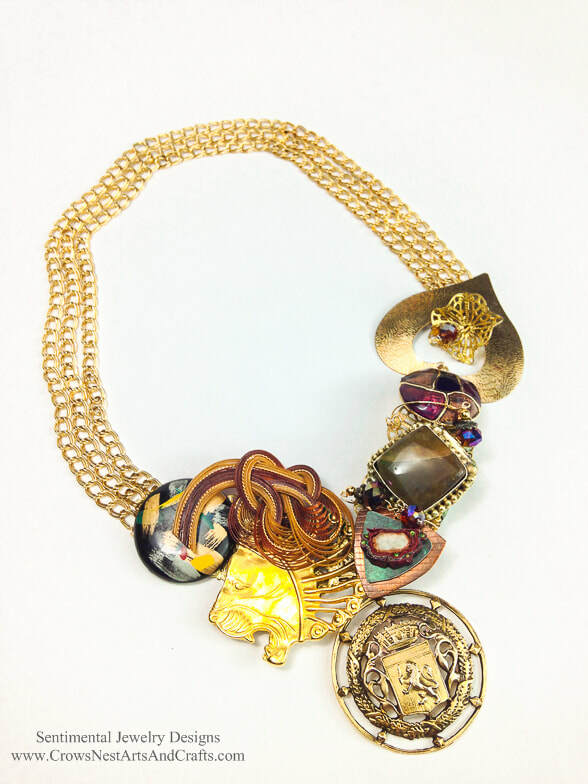 It is collage of upcycled and vintage jewelry in the length of 18"-20". 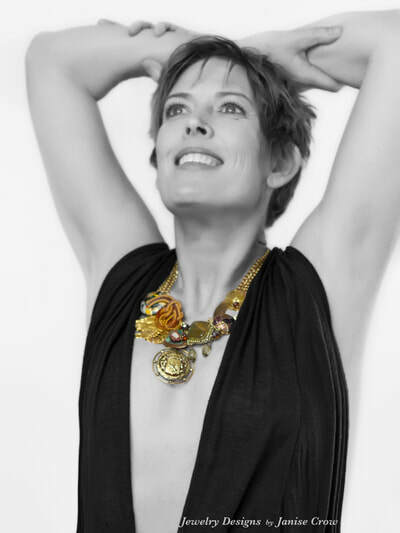 even though this is larger assemblage necklace it is surprisingly comfortable and easy to wear, this is the perfect all-day necklace for dressing up jeans and a t-shirt. And it works equally well as a statement piece when you're style is slightly fancier. This is an example of a theme based custom designed necklace to Honor Women. It is titled "Strong Women". 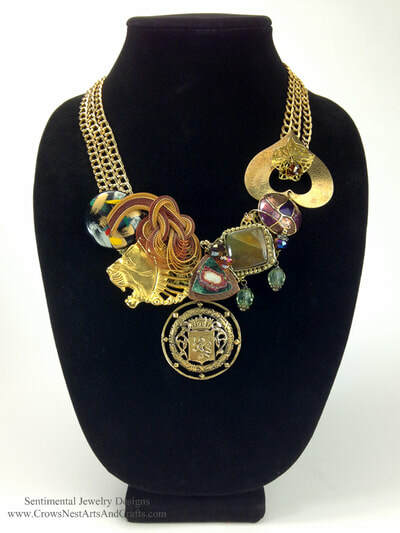 You are ordering a custom necklace similar in style to the one shown in your desired theme to honor or celebrate a time, person or place that has special meaning. Janise creates one-of-a-kind jewelry using your sentimental tokens, re-purposed jewelry, found objects that represent a theme or message expressed in wearable art form. Each necklace will be different based upon what she uses to create it and the story being told.